Food enhances travel like nothing else. 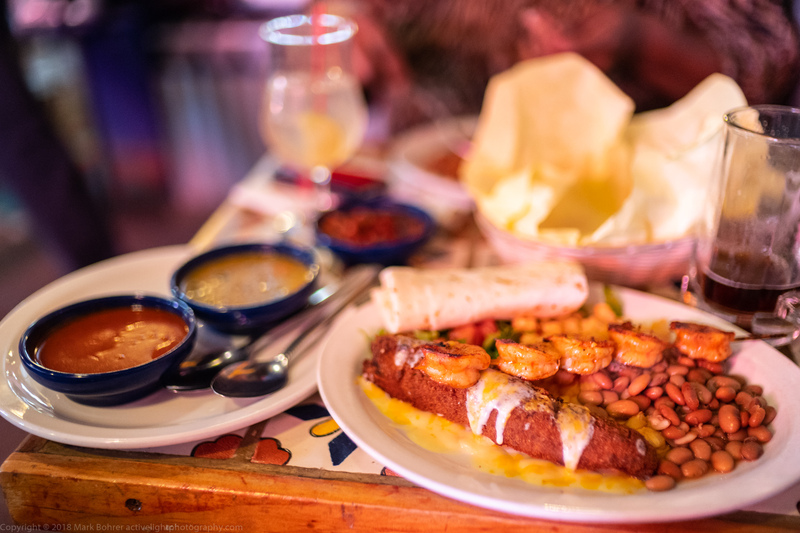 Especially in New Mexico, what you’re eating defines the place. If you want instant ID as an insider, order Christmas on the side when your server asks, “Red or green?” That gives you both types of chili, and lets you add as much as you want – gut-smoking hot, or survivably mild. The craft beer explosion gives you lots of choices for beer that isn’t necessarily yellow. And that tasty chocolate chili stout comes with inexpensive New Mexican cuisine or burgers, depending on the brewery. Finally, Taos boasts some of the best food in the state, without Santa Fe prices. My wife had proposed a weekend at the Taos Lilac Festival, complete with pet parade. So after the usual two and half hour drive from Albuquerque, we found our RV campground and went looking for dinner. 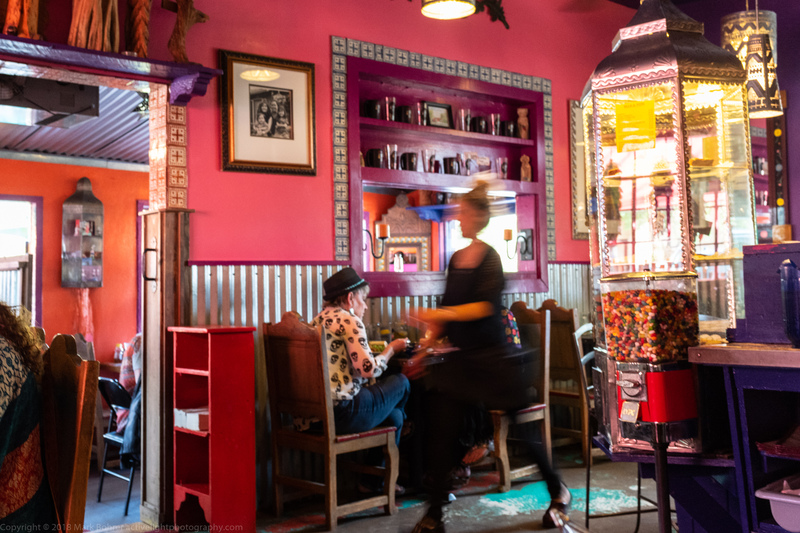 Just north of Taos in El Prado, Orlando’s Cafe serves up an eclectic mix of traditional Southwestern favorites with a New Mexican twist. You feel like you’re eating in an old friend’s funky house, complete with red walls and local artwork. I ordered a pork tamale and chile relleno with skewered shrimp to go with my oatmeal stout from Albuquerque’s Bosque Brewing. Blue corn chips and chili-spiced salsa occupied us while we waited for dinner. Everything arrived quickly, courtesy of fast-moving wait staff. The noise level was always low enough to allow our own quiet conversation. After pup-watching and craft shopping at the Lilac Festival the next day, we dropped into Martyrs Steakhouse just across the street. This is like eating at your classy friend’s house, complete with nice wood furnishings, sheer-curtained windows and white tablecloth. Patio dining allowed us to bring our pups to dinner too. I found an old favorite beer here – Old Rasputin Russian Imperial Stout from Fort Bragg, California. I know not to have more than one of these if I want to walk instead of crawl out afterward. Its dark malty flavor and low bitterness make it easy to drink. I ordered braised chicken over rice and spinach to go with it and the excellent bread. Everything had a fresh-spiced, slightly salty flavor with just enough tender texture from the chicken. After a late night shooting stars, we took a leisurely brunch the next morning at Michael’s Kitchen. This place has been around a long time, and for good reason. My favorite Vive La French Toast (should really be Vive Le Pain Perdu en Francais) comes with eight sweetly-battered pieces topped with an egg done to order, and your choice of bacon or sausage on the side. I always smother everything in maple syrup, and snarf away. 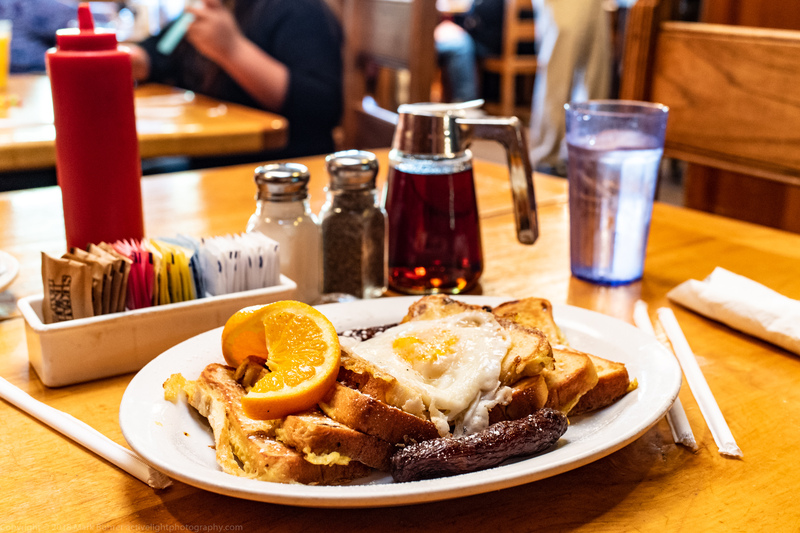 Michael’s serves some of the best breakfasts anywhere in the state, and their signature potbellied stove adds to the wood floor and viga-beamed ceiling for comfortable ambiance. 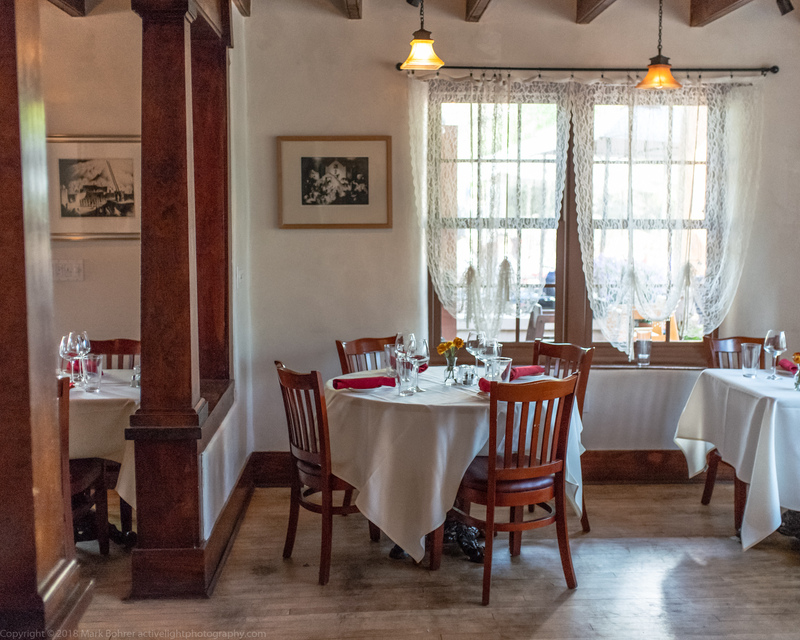 There are other places to eat around Taos – Lambert’s on Bent Street comes to mind as an alternative to Martyrs – but these are three we keep returning to. 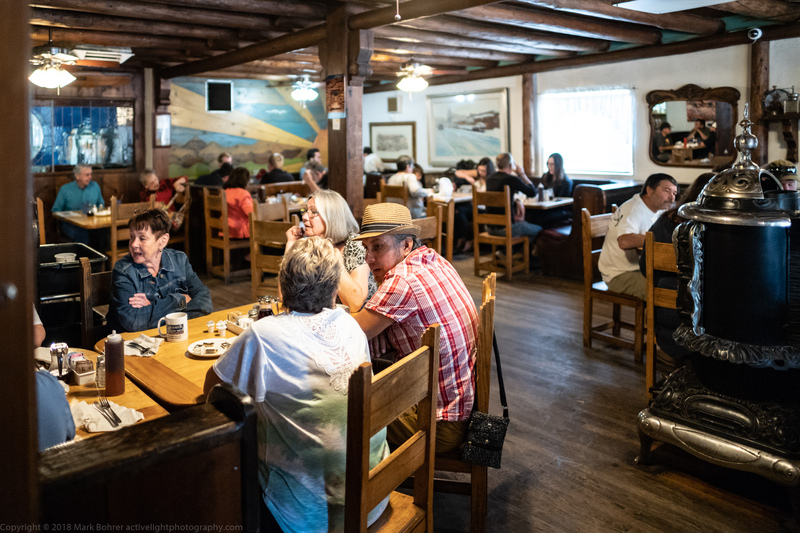 We did discover that Taos Mesa Brewing has gone south, from sturdy metal chairs at the bar to rickety wood ones, and from packed to just one patron when we went to check it out. They’re trying to pitch it as a spot for local live music, but way too high at $20 a pop for admission. The overall impression now is a neglected venue, unfortunately. But otherwise, it’s really hard to go wrong with food in Taos. My Voigtlander 35mm f/1.2 Nokton VM II practically lives on a Leica SL, and is my food and restaurant lens of choice. 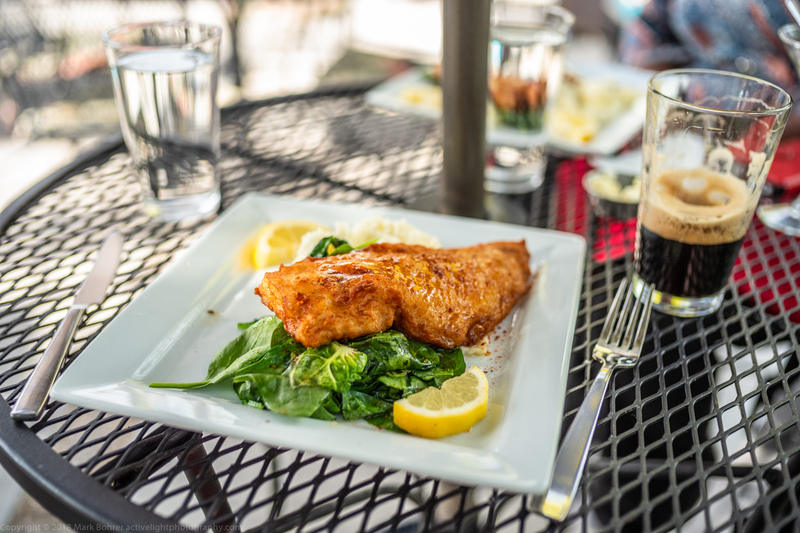 It focuses down to 19″, which is about enough at 35mm to isolate a plate of food and drinks, especially at f/1.2 or f/1.4. I’ve lately started to stop down to f/2 for more than the sliver of depth of field at f/1.2, but if it makes you hungry at f/1.2, hey, that’s what you want in a food shot. I try to capture specular reflections – bright highlights – off moist sauces and cheese to give life to the food. If I were shooting for a client, I’d use supplemental lighting and complementary plating colors, and style everything for the best appearance. I also used a 24mm f/1.4 Summilux-M ASPH for restaurant interiors. (If you hunt around, you can find them in good shape used for half the very high new price.) While it won’t focus as close as the 35mm f/1.2 Nokton, the 24mm Summilux has wider coverage and a unique look I like for interiors and events, especially at f/1.4. Unfortunately, it’s not as robustly constructed as some of Leica’s older lenses. Not long after our Taos trip, I overtightened the lens hood and broke a front screw. So the lens is out at Steve’s Camera Repair Center in Culver City now.